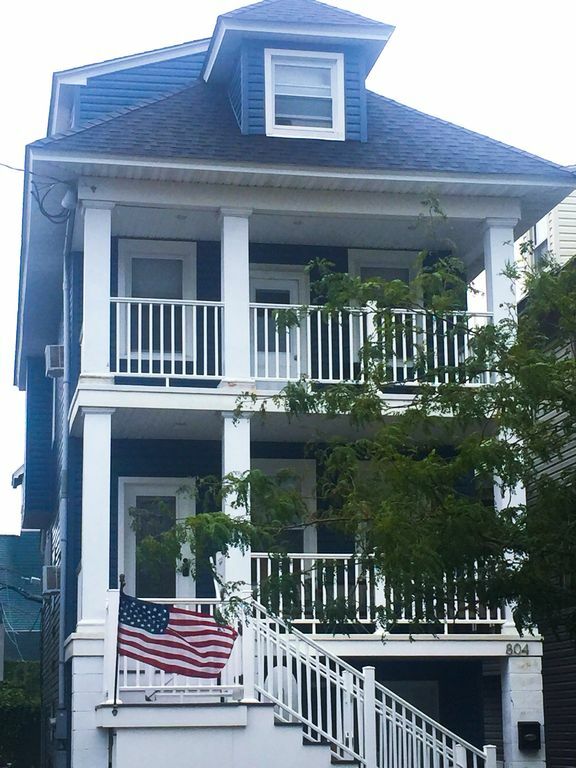 Our home is a beautiful and classic Ocean City beach home. We are located just a block to the beach and boardwalk in the North End. Our first priority is always to provide a clean and comfortable vacation rental. We provide many extras to help make your stay relaxing and enjoyable! We provide all the linens you will need: sheets, blankets, pillows, comforters, towels, washcloths, etc. We also provide toilet paper, hand soap, paper towels, and kitchen essentials such as coffee, tea, condiments, paper goods and more. We try to have our guests only bring their clothes and their food. Leave the rest to us! Our home is air-conditioned with window and floor units. Each bedroom has a separate unit. We also have ceiling fans and stand fans so you can enjoy the ocean breezes if you like! For the beach we have beach chairs, beach umbrella, beach toys and beach wagon for you to use. After you have finished at the beach enjoy a nice hot shower in our enclosed after beach shower. For both the inside and outside showers we provide shampoo, conditioner, soap etc. We have parking for two cars in the rear of our property. During the week plenty of parking is available on our street. We have outside seating on our porch for you and your family to enjoy the beautiful summer weather. For entertainment, we provide premium cable TV (including HBO) with voice activated remote, wireless web access, Wii game system, and plenty of board games. Our kitchen is fully equipped with refrigerator, freezer, dishwasher, microwave, gas range, toaster, blender, coffee maker, and Keurig machine. Our dining room table seats 12 and we provide a high chair and booster seat. We also have pack and plays at the home along with a bouncy seat and floor gym. If there is something you are looking for and don’t see, just ask! We may have it and will be happy to provide if possible. 6 beach tags are included (only required for those 12 and over). Dogs allowed WITH permission. No other animals are permitted. If you need to sleep more guests, ask about adding our lower unit as well. WE ACCEPT CREDIT CARDS, CHECKS AND MONEY ORDERS. My husband and I have vacationed in Ocean City since childhood. My husband's family rented a couple of streets over on Brighton Place, so when we saw this property on the market, we knew it was 'the one!' We have three young children, so we try to supply and stock the home with everything a family needs. We also just experienced the passing of our beloved dog, Frosty, so we also understand how important the furry members of your family are! We love the North End location. Our street is quiet but still near everything. We loved that we had the offstreet parking and that this property had two units so we also had an opportunity to use our vacation home! We try to provide our guests everything they need for an enjoyable vacation. toilet, shower, on floor with bedrooms 4, 5. The beach is just at the end of our block. A short walk, even with the kids! We have plenty of window units plus a floor unit. The living room and dining room each have their own unit which cool the first unit level. Additionally the living room, dining room and kitchen have ceiling fans. The 3 bedrooms on the middle unit level each have a window unit and ceiling fan. The top unit level has a floor unit and stand fans. We replace the units every couple of years to ensure they are in good order for our guests. Parking for two cars. One in front of the other. Paper goods, condiments, spices, etc all provided. includes spices, small appliances, and everything you need to make nice family meals on vacation! dining table seats 12. booster seat and high chair provided. card table also provided for additional seating. Digital cable with on-demand. Premium cable channel package with HBO. Voice activated remote. Due to the layout of our house, we do not recommend wheelchairs. Outside 'after-swim' shower, off-street parking, game system, toys, games, puzzles, books, video library, beach tags. My Blue Heaven was exactly what we were looking for with our stay in Ocean City! Tons of space, nice condition, and a great location. Theresa was also terrific as property owner! A great house, close to the beach and boardwalk, and well-stocked with everything you need! Fifteen of our family members had a wonderful time in this big house! We esecially enjoyed the two porches, the large living area, and the long dining table that seats 12. It’s stocked with paper towels, laundry supplies, toilet tissue, soap, shampoo, and more! The only reason I didn’t give it five stars, is because the bathroom doors don’t lock, and some of us got to know each other a lot better than we would have liked! Overall, a wonderful vacation in a great house! Great house. Great location. We would stay again! This property has all the bells and whistles to make a stay at the beach more convenient. It really does feel like a home away from home. Our family enjoyed our stay. Thank you. Lovely property - has everything we need! We love staying at My Blue Heaven. The owners are always very accommodating and the house is stocked with everything we need! All you need is your personal belongings & your family, that's it! Everything else is provided for! We were beyond pleased with the house and everything that the owners have thought to provide. From coffee makers (keurig & a traditional coffee pot! ), to every pot, pan and utensil you could possibly need to toys, books, video games, sheets, pillows, pack & plays, beach toys and carts, they have literally thought of everything! It's also an easy and quick walk to the boardwalk and beach, which was very nice with so many family members and kids in tow. We brought our ENTIRE family (grandparents, nieces and nephews, etc...) and filled every bed however we never felt cramped or crowded. We really enjoyed the book that was left for us with lots of helpful information, take their recommendation on the Mexican Restaurant, the fried fish tacos were AMAZING! Would definitely rent again! Post-season visits to the NJ shore can often be a disappointment, with properties that are damaged and dirty, offering broken appliances and missing essentials. Not so here. The convenience of not having to pack linens, towels and basic supplies was a huge time saver for us. The beds were comfortable, the porches provided breezy outdoor spaces, and the location was convenient to both the beach, boardwalk and local stores. The house is on a quiet street of well-maintained homes. The landlord answered our questions promptly. What more could we ask? Great Family Vacation Spot. Walk to beach, restaurants, amusements, shopping and more. Just a short drive to Atlantic City to see the shows or try your luck. And its not far to the Cape May Zoo, Storybook Land, Malls, Shopping Outlets, Casinos, Nightlife and more! ACCEPTED PAYMENT TYPES: CHECK, CREDIT CARD, PAYPAL. PAYMENT DUE IN FULL 90 DAYS PRIOR TO CHECK-IN. DOGS ALLOWED WITH PRIOR APPROVAL. NO SENIOR WEEK/COLLEGE RENTALS. SECURITY DEPOSITS RELEASED FOR RETURN 14 DAYS AFTER CHECKOUT. ALLOW UP TO 1 WEEK ADDITIONAL PROCESSING TIME FOR HOMEAWAY. NO TAXES. NO CLEANING FEES. *** You must however return the home in "broom clean" condition. That means you need to tidy the home before departure, lock windows/doors, remove trash, etc. Our units are cleaned by a cleaning service between each rental. **** CANCELLATION POLICY. If you need to cancel your reservation prior to check-in, we will do our best to accommodate you. If we can re-book your reservation for the FULL price, then we will refund the full amount (less a $75 processing fee which may be waived at our discretion). If we can re-book your reservation but have to accept LESS than full price (usually happens when cancellation is requested near your check-in date) then you will receive a refund of the amount paid less the difference in reservation prices and $75 processing fee (again may be waived at our discretion). You may purchase travel insurance if you wish. If you have an emergency and need to cancel, we really do our best to work with you.